The Okavango Delta is a haven for Cape Buffalo which occur in herds in their thousands. 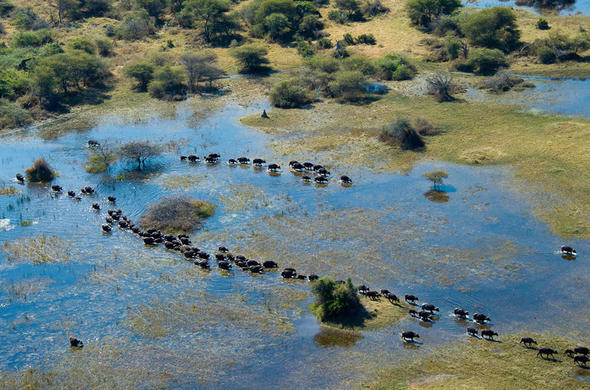 These herds move between the permanent waterways of Northern Botswana. 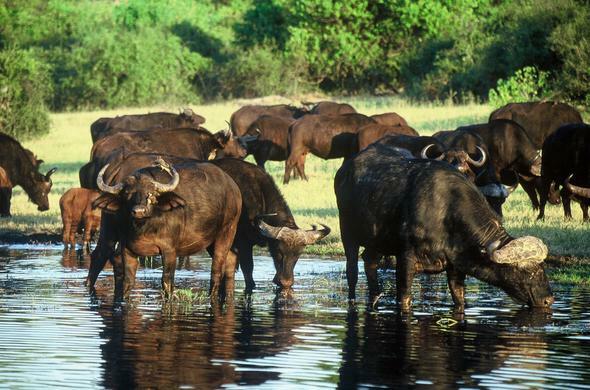 The northern water ways of Botswana are one of the best places in Africa to see Buffalo. These formidable creatures are one of Africa's Big Five and have a reputation for being extremely dangerous, especially when wounded. 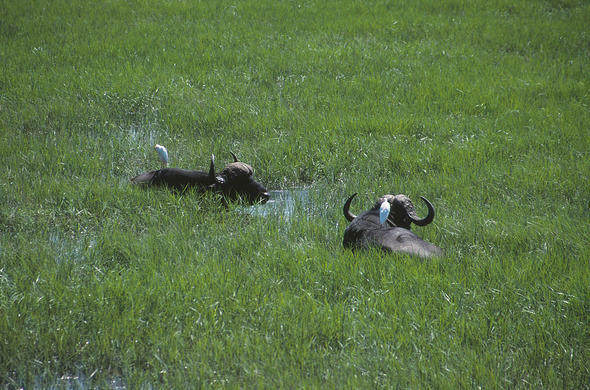 Buffalo are the third most numerous antelope in the Okavango. They need to stay close to water and enjoy grazing on the seasonal floodplains around the Delta. 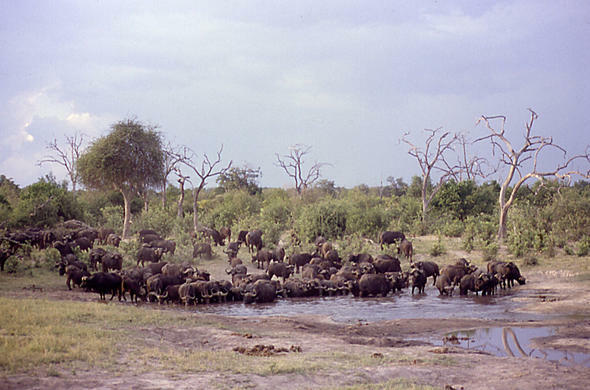 Large herds that number in their thousands move between the Chobe region and the Okavango. These are usually mixed herds that include females and breeding males.Older males are generally forced out of the group. They tend to be solitary or for bachelor herds. You might hear guides refer to them as "old dagga boys". The word "dagga" is Zulu and means mud - it refers to the fact that they like wallowing in mud. Buffalo are large animals and can weigh up to 700kgs. They are grazers and eat the longer grass which allows other grazers to access the shorter grass. 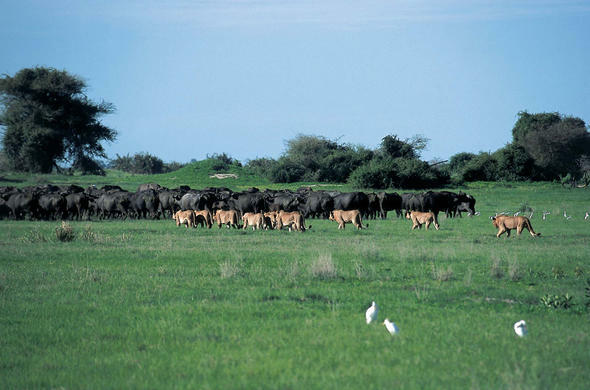 Buffalo can also eat grass that is less nutritious, especially in the dry season, which means they do not migrate as far as other animals in the Delta, such as Zebra. Buffalo are the favourite prey of Lions, and where there are Buffalo, the Lion prides are sure to not be far behind. There is a fairly permanent herd of around a thousand Buffalo that live on the Duba Plains in the Okavango and there are a couple of prides of Lion that regularly hunt them. This is one area where you are almost guaranteed to see a Lion kill. The Buffalo often migrate between the seasonal savannahs of the Chobe region and the Okavango and can usually be found in the Chobe/Linyanti areas and the Khwai regions of the Delta.